Where's Linklater when you need him? Harvested from a host of horror film cadavers, Sinister is engrossing, effective and just plain scary as hell. 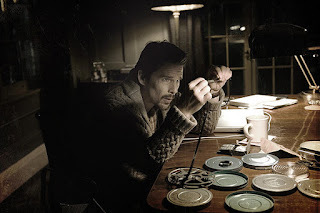 Ellison Osborne (Ethan Hawke, top-notch), a true-crime novelist, moves his family into their new home, which just happens to be the site of a recent family hanging, hoping to pen his return to past acclaim. When Ellison stumbles across a box of Super 8 film capturing this grisly murder and several decades of similar slaughters, it triggers a chain reaction of chills and things that go bump in the night. With a gripping opening shot that establishes a paralyzing tone, this frightener from director Scott Derrickson lifts from The Shining, The Ring, Saw, the found-footage subgenre and many other influences, but Derrickson also makes smart use of camera angles and framing to concoct scares both actual and perceived. The film falters from a trite denouement that strays too far into the supernatural. But amidst all the homage, Derrickson also finds ways to subvert the rules: If you think just moving out of the haunted house will secure safety, think again.